Miami-Dade Cultural Affairs provides grant support to community based organizations in order to invest in and strengthen cultural organizations that provide youth arts programs for children and families, and to increase opportunities for kids to engage in direct, high quality, live arts experiences as a part of their overall education. For more information about the wide array of cultural arts programs available for children and youth in Miami-Dade County, click on the program links below. Summer Arts & Science Camps for Kids provides more children with the opportunity to attend established, high quality cultural arts and science summer camp programs at little or no cost. Have fun, make friends, make art, get creative in this inclusive, socially-oriented arts program for children and youth with and without disabilities. VSA Florida 2017 Summer Camp for teens with autism and related disabilities. Explore the exciting world of animation and filmmaking as you learn real life skills. Youth Arts Miami supports organizations that have year-round programs and whose primary mission is to create, present or exhibit cultural programs for, and/or with, children and youth. The Youth Arts Enrichment Program enriches the lives of children through the arts by making live arts experiences available to more children and families throughout Miami-Dade County. Looking for more summer and after-school programs? Check out The Children's Trust Summer & After-School Programs Guide. 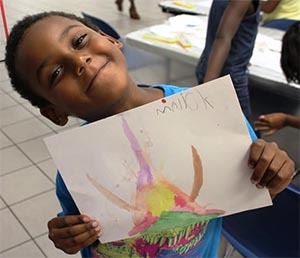 The Youth Arts Enrichment Program (YEP) and the Summer Arts & Science Camps for Kids (SAS-C) program were created as a joint initiative of the Miami-Dade County Department of Cultural Affairs and The Children’s Trust. The YEP and SAS-C Grants Programs are funded by The Children’s Trust. The Children's Trust is a dedicated source of revenue established by voter referendum to improve the lives of children and families in Miami-Dade County by making strategic investments in their future. Youth Arts in the Parks was developed by the Miami-Dade County Department of Cultural Affairs as part of its “All Kids Included - Accessible Arts Experiences for Kids” (AKI) program, made possible with the support of the Miami-Dade County Department of Cultural Affairs and the Cultural Affairs Council, the Miami-Dade County Mayor and Board of County Commissioners, and in part through grant funding provided by The Children’s Trust.